This item is reusable waste. If this item is in good condition, take it to a Peel Community Recycling Centre (CRC) reuse drop-off area. 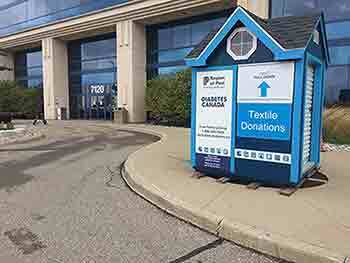 The Salvation Army Thrift Store, the Salvation Army Thrift Store Donor Welcome Centres, and the Bolton CRC ReUstore provide reuse services to Peel residents. Discarded items that are oversized, in poor condition, or missing parts may not be accepted for reuse. A disposal fee may apply to these types of items. Staff have the right to refuse items that contain hazardous materials or could contain sensitive or confidential information. Staff have the right to refuse items that are banned or recalled by Health Canada or the Canadian Standards Association (CSA). Staff have the right to refuse items due to sanitary, health, or safety concerns. 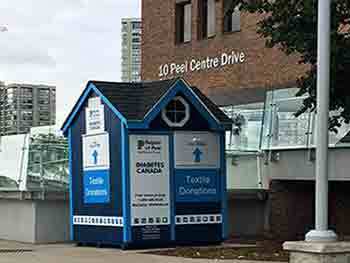 Sheds are located just outside at 10 Peel Centre Drive or 7120 Hurontario Street. Always check the acceptable items you can drop in the shed before disposing of the item. If a reusable item is broken or in poor condition, put it in your garbage cart. Place larger items on the curb for collection. Find your collection calendar.